Cruise lines are partnering with master chefs to offer guests magnificent gourmet cuisine – yet another reason to set sail in 2017. Offering tempting flavours from the East, Silk Road restaurant and The Sushi Bar on Crystal Symphony and Crystal Serenity feature the eclectic cuisine of master chef Nobuyuki “Nobu” Matsuhisa. Chef Nobu has redefined sushi with an innovative blend of classically styled Japanese foods with Peruvian and European influences. While The Sushi Bar offers an assortment of Nobu’s sushi and sashimi, Silk Road presents more than two dozen of his signature appetisers, soups, salads, entrées and desserts. 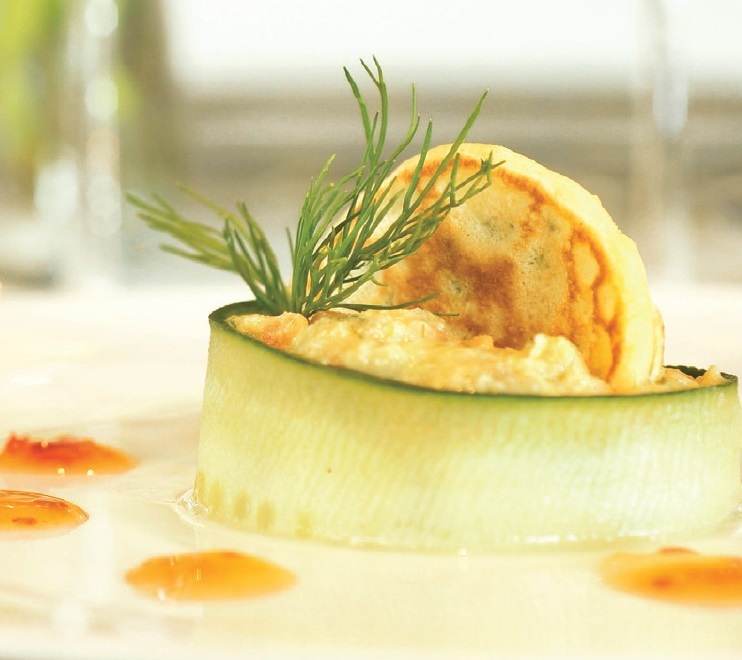 Oceania Cruises offers some of the finest cuisine at sea – mainly due to the contribution of master chef Jacques Pépin. Marina and Riviera, two of the cruise line’s six ships, have complimentary dining venues: Jacques (Jacques Pépin’s French bistro) and the Asian restaurant Red Ginger. To explore epicurean delights in a private setting, there is La Reserve by Wine Spectator, where up to 24 guests can indulge in vintage wine and gourmet food pairings. Restaurants on other ships include Toscana and Polo Grill, while Sirena features the new speciality restaurant Tuscan Steak. P&O has made headlines in the past couple of years with the launch of its crew of Food Heroes. At the same time, The Cookery Club was created on flagship Britannia with the idea of bringing top-notch British cuisine to cruise guests. 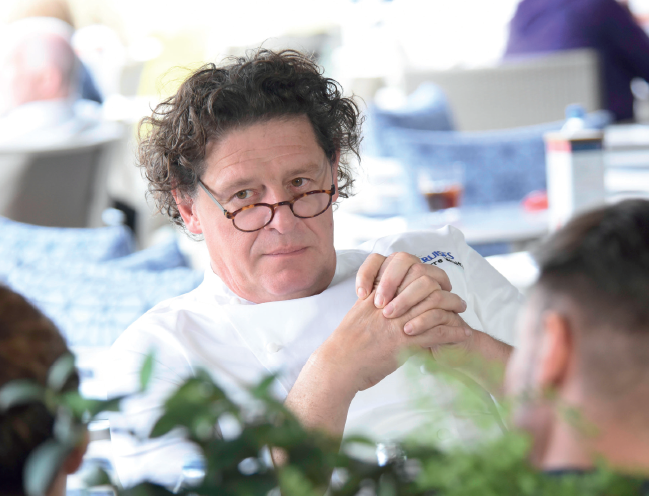 It’s full steam ahead with the P&O Cruises cookery programme, as chef Marco Pierre White adds new dishes across the fleet to create a series of gala dinner menus using local and speciality ingredients. On the patisserie side, Eric Lanlard’s mouth-watering Pavé Royal will be an addition to the cruise line’s special Chef’s Dinner, which takes place in the main dining room. 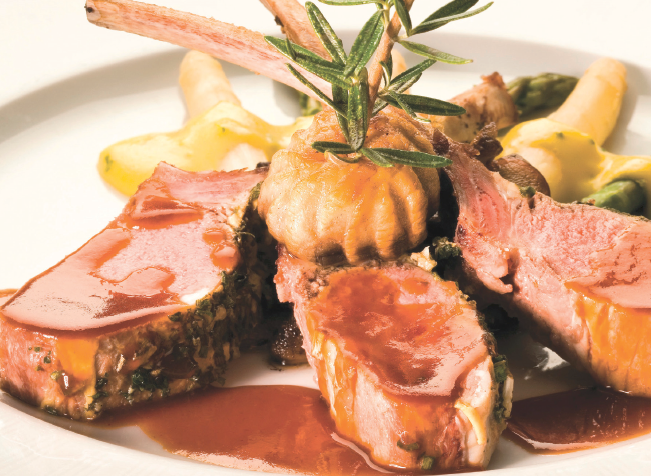 This award-winning ocean and river cruise line reflects each itinerary in the cuisine offered on board. For instance, Viking Cruises’ 15-night Mekong river cruise focuses on fresh Asian cuisine, such as shrimp pan-fried noodle, Chinese potstickers and firecracker chicken. Expanding on the cuisine theme, there are opportunities in Hanoi to take wooden sampan tours to see a floating fish farm and explore the Mekong rice fields. Back on board you can look forward to attentive table service at The Restaurant, where you can indulge in a relaxed, multi-course fine-dining experience. Open seating allows you to eat with the same companions or meet someone new each day. Alternatively you can enjoy a more casual meal – from a breakfast croissant to lighter evening fare – on the Sun Deck, the outdoor Aquavit Terrace or the al fresco dining area located at the bow of the ship. 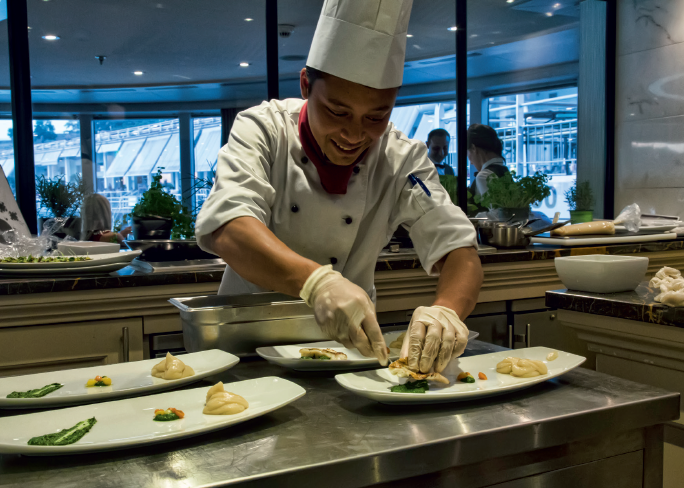 A member of prestigious culinary group La Chaîne des Rôtisseurs, AmaWaterways has enhanced its culinary offerings across the fleet. At the revamped Chef’s Table restaurant you’ll find a tasting menu of three appetisers, a champagne sorbet intermezzo, three main courses and three desserts, plus a greater variety of regional specialities and traditional dishes. At the Chef’s Table, which seats 28, a demonstration kitchen is part of the entertainment, and you can watch as your dinner is prepared. Each course is paired with a regional wine, and the Chef’s Table is included in the cost of your cruise. Harmony of the Seas and Anthem of the Seas are Miami-based Royal Caribbean Cruise Line’s newest and largest ships. Each has 13 restaurants on board, offering an incredible variety of cuisine. Wonderland specialises in experimental food, providing an amazing experience and taking gastronomy to new heights. The Asian-inspired Izumi offers sushi, sashimi and tableside cooking, while chef Travis Kamiyama has access to a “super freezer“ which freezes fish to -76C, meaning his sushi is always incredibly fresh. Jamie’s Italian is another popular restaurant on Harmony of the Seas, featuring the fresh, simple ingredients that have made Jamie Oliver one of the world’s most celebrated TV chefs. The French America Line, whose flagship Louisiane began sailing in October 2016, celebrates regional food, music and culture in ports of call on the Mississippi, Ohio, Tennessee, Cumberland and Red rivers, where larger ships cannot navigate. On the “Jewels of the Heartland,” a 10-day cruise tour from St. Louis, Missouri to St. Paul, Minnesota, chef Regina will be on board and guests will sample local meats, cheeses, ales and ciders. Mississippi River itineraries feature America’s iconic South which is brimming with historic antebellum homes and lush plantations. Silversea has an exclusive partnership at sea with the luxury hotel and restaurant group Relais & Châteaux, and each one of the cruise line’s classic ships has a Relais & Châteaux restaurant on board. These refined and elegant French eateries offer traditional gastronomic excellence – while for something a little more cutting-edge, try The Grill, where you can select from the finest meat, fish and vegetables and cook the ingredients yourself on a 400C lava stone. Everyone loves Italian food, and reflecting Silversea’s national heritage, every ship in the fleet also has an Italian restaurant on board. TV shows are recorded, and the 45-minute demo courses will feature a mix of video content, live instruction, taste tests and recipe samples. Some of the courses in development include Asian Dumplings, We Love Chocolate, Everything Salmon, Flavours of the Mediterranean, Meatless Monday Meals and New Italian Favourites. Also planned are 90-minute workshops that focus on teaching a specific skill. The “French touch” is paramount in Ponant Cruises’ philosophy, describing a way of life in which gastronomy takes pride of place. Guests can look forward to a feast of fragrant flavours, carefully selected cheeses and wines, delicious speciality breads and sweet pastries created by renowned patissiers Maison Lenôtre. Maison Taillevent provides a fine selection of vintage wines by the glass, while Maison Veuve Clicquot takes care of the gala cocktails, and the Ladurée bakery ensures that afternoon tea is truly special.